Greetings, true believers! 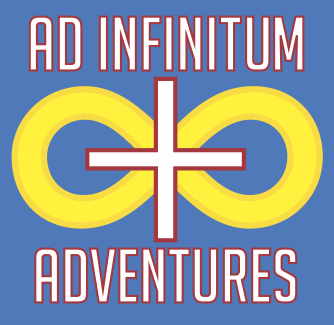 Folks who have gotten used to the twice-monthly blog updates about the ongoing Icons A to Z series in 2015 are likely going to be hearing less from me this year, simply because plans for Ad Infinitum and Icons releases in 2016 are a bit different although, I hope, no less exciting. In particular, the schedule doesn’t feature a subscription or periodical product, simply because I didn’t have one I wanted to do on a regular schedule, although that doesn’t mean any less Icons—if anything, this year may see more! Speaking of Icons A to Z, the start of this year saw the release of last year’s ongoing series as a complete book, available in both electronic and print-on-demand formats. It’s over 150 pages of Icons goodness, from Aliens to Zombies and more, including lots of optional and expanded rules, guidelines, and resources for your games. The other big release last year was Icons Assembler, a character creation and management application to replace the outdated Icons Character Folio. Designed by Joe Wetzel of Inkwell Ideas, the Assembler is an even more robust application, letting you create and save characters with just a few clicks and providing in-play tools as well. As I recently announced on this blog, I’m working on a spruced-up new printing of the Great Power sourcebook, removing references to the pre-Assembled Edition printing of the Icons rules, fixing known typos and errors, and making sure things match up smoothly with the Assembled Edition of the rulebook. Folks interested in helping out and submitting feedback can do so online using this form, ideally in the next 4-6 weeks, as work is already ongoing. The big new project of this year is Adversaries, a collection of new and updated villains. It uses material from the old Villainomicon and other Icons products and adds quite a few new bad guys. Artist Dan Houser is already hard at work on concept sketches and is coming up with some awesome stuff as he and I bounce ideas off of each other. While I considered releasing Adversaries as ongoing periodical subscription content, I decided I’d rather work on the collection as a whole and release it all at once when it’s done, which should be in the first half of the year. Lastly, there’s wrapping up Dan’s Rise of the Phalanx adventure series with Reign of Chaos this year and looking to release a complete compiled collection of the epic series, including a print-on-demand book. There’s at least one other adventure in the works which I’m not ready to announce until it’s done, but what I’ve seen so far looks good. Plus I’ve got a back-burner item of revising some of the older “classic” Icons adventures and potentially releasing them in collections as well (possibly including print-on-demand options). I’ve got other ideas for Icons products, but those depend on how much time I have beyond what you see here (and working on projects for Green Ronin, Copper Cauldron Publishing, and my freelance gigs…) so no announcements until they actually happen. Fainting Goat and their upcoming Kickstarter for Against the Axis, a Golden Age WWII setting sourcebook for their Stark City setting, written by industry veteran Steve Perrin! Plus their World’s Most Wanted series of villains. Rogue Genius Games and their ongoing Iconic Legends series of characters, who will seem quite familiar—yet intriguingly different. HAZARD Studio and their Enemy Strike Files series. … and more besides. DriveThruRPG lists nearly three hundred Icons system products as of this time! Not bad for a lil’ one-off superhero game, huh? This entry was posted in Publishing and tagged 2016, ad infinitum, icons. Bookmark the permalink.